Master touches the hearts of people in the Buddha's Land - Nepal. Monday, May 1, was a beautiful, hot day with the sun's rays warmly welcoming Master to Kathmandu, Nepal. Hours before the lecture, crowded buses and people jammed together in front of the city's Birendra International Convention Center. Many people also passing by on bicycles and cars slowed to a stop just to behold the billboards bearing Master's beautiful portraits. About 30 minutes before the Convention Center's doors opened to the many anxious Truth seekers waiting outside, the dark clouds that had been looming overhead suddenly opened up and released a torrential downpour. Jagged flashes of lightning appeared and thunder crashed, as the temperature dropped a refreshing 10 degrees Celsius and Master's blessing power became evident! 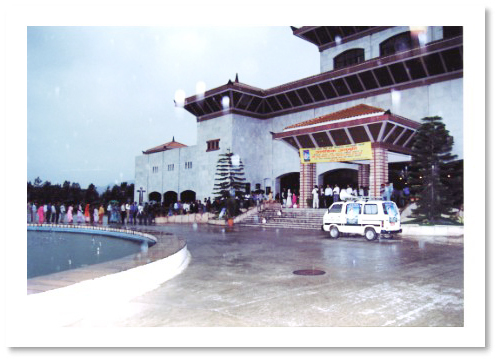 Five large rooms in the Center had been prepared for the thousands of people expected to attend the Nepal lecture. Large-screen TVs and loudspeakers were also set up for guests who might be standing outside. The enormous crowd entering the hall filled the rooms to overflowing. Even at the end of the lecture, there were still at least a thousand people waiting outside the hall, longing to see Master. When Master arrived, people rose to their feet applauding heartily, and the atmosphere teemed with excitement. Master, dressed in a simple yet elegant, ivory, traditional Nepalese sari-type dress with loose fitting sleeves, was radiant. Flowers and tall evergreen trees adorned the stage, while Master's sofa was covered in a multi-patterned Nepalese fabric. 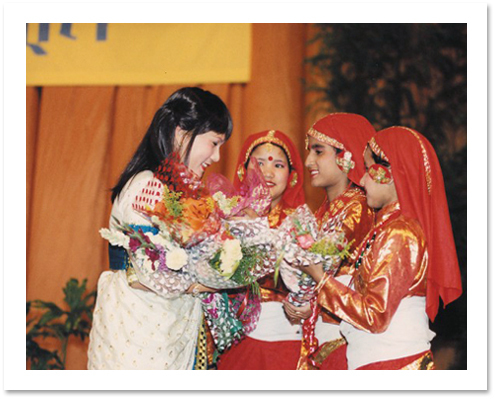 Local children wearing traditional Nepalese costumes and several adults made a flower offering to begin the program. 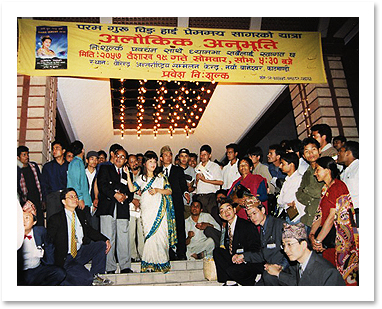 Addressing the large audience, Master said that She felt a great deal of love, as well as the purity of the people of Nepal -- Buddha's land, (Note: Buddha was born in Lumbini, in southwestern Nepal, approximately 2,500 years ago. ), and that it was Her honor to be in this beautiful country. She expressed surprise at the hot temperatures of Kathmandu, explaining that She was once in the Himalayas of India and thought that Nepal would have a similar climate. Instead, She found Nepal to be warm, like the hearts of its people. During Her lecture, Master reminded the audience that we are already love, warmth, and wisdom, but some of us have just forgotten. The people, who remember their own Self, their God Nature, or Buddha Nature, are called "enlightened beings". Those who don't remember their own Original Nature are called "not-yet-enlightened Buddhas", but Master pointed out that both are Buddhas. When we lack the knowledge that we are God, we feel that our lives are not fulfilled, not happy, not contented. Master said that all the misery and unhappiness on the planet are caused not by war, not by poverty, not by the conditions that we live in, but by lack of wisdom, lack of knowing that we are more than just a human body. For example, many kings, many leaders, many rich and famous people are not happy and keep wanting more power, more money, more position, more everything, and they are still not happy. But the Buddha, even as a future king, forsook everything and had nothing with Him, and was happy; because the Buddha remembered who He truly was and the other people did not remember. The Buddha also said, "I have already remembered that I am a Buddha, and you will be the future Buddhas." In the Zen Buddhist tradition, the difference between enlightenment and ignorance is just one hair's breadth. Master asked, "How can we traverse this difference, even though it is so subtle? How can we? Can we?" and replied, "The answer is 'Yes', because the Light that is within us never dies out. The Light of Buddha that was imparted to the circle of His disciples, the Light of Krishna and the Light of Shiva has never died. It has been continuously transmitted from one being to another, from one country to the next, and is always shining. If we find this Light, it is transmitted to our unlit candle so that our candle will be lit right away. The only difference between enlightenment and non-enlightenment is where we place our attention. If we pay attention to the body, the physical surroundings, and everything that is in this material world, then we are material beings; we are in the material world. If we pay attention to the inward Nature of our Self and our God Nature, which is always within us, is inborn and never dies, then we become an enlightened Master. That's the only difference, and it's very simple to traverse this difference." "When we turn our attention inward to our Original Self, we will see the Light, kingdom of God, heaven, and whatever will make us elevated, happy and wise. When we turn inward to hear our own Nature, we will hear the true teachings directly from God, from heaven, and from the past, future, and present Masters, which are nonverbal, which are direct, which are uncontaminated, which are everlasting. These teachings make us remember that we are God, that we are from God. This can happen immediately. We just have to turn inward." This is an enlightened person. There is no attachment of any kind, either to poverty, to renunciation or to kingdoms. Enlightened beings will do whatever the situation requires, whatever is beneficial to sentient beings, because within them are happiness, peace, and love. They have no need for material or nonmaterial assistance in order to be contented. To enlightened beings, everything they do is just for the benefit of others; they do it or don't do it; they take something or don't take something. Even if they eat food or drink milk, everything is for the sake of other beings. In order to be contented, to be peaceful, happy, loving and truly happy inside, we must remember who we truly are inside, like the Lord Buddha and so many other great Masters. One of the great Masters of India was very poor. Someone, maybe a princess, gave him a diamond, a gem. It was worth a fortune, but he didn't bother to take it. She had placed it in the roof, and when she came back, it was still there. To an enlightened being, being poor is nothing. He could also become rich if he wanted. He doesn't have to stay in poverty, yet for him being rich or poor is equal. These Masters have no more attachment to what they have or don't have, because they already know everything in this world is not their true Nature. They already know the kingdom of God. To attain this kind of contentment and peacefulness, we also should search inside and find our true greatness. It's easy to remember our Self -- easier than breathing, eating or talking. Advertisements don't fulfill our needs, they don't satisfy our desires. We need the real thing. Enlightenment is the real thing, not talking about it, introducing it, or advertising about it. An advertisement might say, 'Coca-Cola is great'. Another might say that apples are sweet. But we never feel anything from advertisements alone. We don't see any Light. We don't feel God's blessing when it's only an advertisement." Master added that it was not like She was going to "give people" anything, because we have always had our true Nature. It's just that we have forgotten where it is. She will show us how to become enlightened, and then we will have our true Nature again forever. 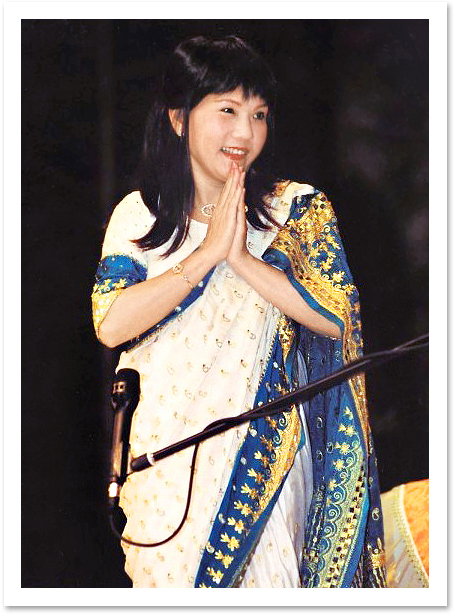 At the conclusion of the lecture, Master walked into the crowd to personally greet as many as She could. Speaking through a microphone to the people outside, She said that although they did not have seats in the lecture hall, they had a seat in Her heart. After the lecture, more than 600 people were initiated. And since the lecture, many people call each day to request initiation! The "waves" from the Ocean of Love Lecture Tour continue to roll ashore in Nepal, as Master's loving presence awakens the hearts and souls of Truth seekers, even after Her physical departure from their country.